Obviously, drag should be smallest for symmetrical airfoils at zero angle of attack. However, most airfoils have camber, and then the lowest drag is at positive lift coefficients in case of positive camber. Where that point is exactly depends on many parameters; in case of laminar airfoils even local imperfections can have a noticeable effect. Generally, the lowest drag can be found at the angle of attack where the stagnation point is exactly at the center of the leading edge, where the local curvature is highest. A deviation from this point will force the flow on one side to negotiate this point of highest curvature all by itself, resulting in a suction peak which will increase the losses in the boundary layer. This is a theoretical drag polar (calculated with XFOIL) of an airfoil with a 20% camber flap at different settings and a Reynolds number of 1.5 million. The laminar bucket is clearly visible and produces a range of lift coefficients with nearly identical drag. The small waviness at the lower end of the laminar bucket is an artificial result of smoothing the plot. What is obvious is how camber shifts the area of minimum drag up and down. If you use the right side of the plot to find the angle of attack of minimum drag, you will find that this is not constant but goes down as flap angles go up. For the 0° flap polar it is at about -2° AoA. This is caused by the induced angle of attack which increases with the lift coefficient. The 6-series NACA airfoils were the first to be systematically designed with the pressure distribution in mind, and the design lift coefficient is where the condition of the ideal stagnation point location is met. This is indicated by the digit right after the hyphen in the airfoil name: Divide this digit by 10 and you have the lift coefficient of minimum drag. 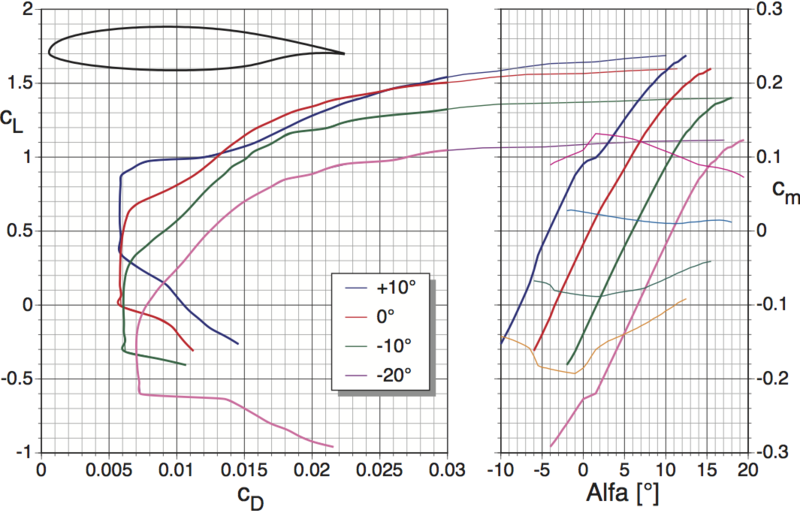 Example: The $63_1-412$ airfoil has its lowest drag at a lift coefficient of 0.4. If you want to know the angle of attack with the lowest drag of a whole airplane, this is a very different matter and needs to include the drag due to lift, which is of course smallest at the zero lift polar point. Not the answer you're looking for? Browse other questions tagged aerodynamics airfoil drag angle-of-attack or ask your own question. How do insects decrease aircraft performance? How to draw NACA 6-Series Airfoils? Do negative angles-of-attack create lift? Does speed or angle of attack generally have the greatest impact on total induced drag?